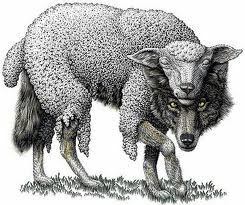 The idiom “a wolf in sheep’s clothing” has Biblical origins. Ancient Greek fables offer warnings similar to those offered in the Bible. Today, the phrase serves as a warning against anyone with a friendly face and malicious intent. The phrase remains popular. In fact, it has its own Tumblr page. Apparently, the phrase is a popular inspiration for tattoos as well. I see that. Nice site!